Sunday was an odd-feeling day spent on the sofa trying to work out what to do with my career now I’ve finally handed in my PhD, and then drifting through the Asda in Peckham. I soaked some borlotti beans in water in the morning, when I also found out that borlotti beans are a kind of kidney bean. Kidney beans and borlotti beans had previously existed in different universes in my mind : one has all the glamour, the other reminds me of secondary school chilli con carne. I didn’t have a plan of what I’d do with the beans, but waited for Asda’s shelves to suggest things. Peckham Asda at 3pm on Sunday doesn’t have the greatest range of meat. Most people panic-buying for roast lunch have been and gone. However, there were some pieces of uncooked ham, smoked and unsmoked, that remained. I bought a smoked ham, as well as leeks, parsley, garlic, two packs of courgettes, onions, crème fraîche, double cream, ricotta and mozzarella (yes, why all of the creamy things? I wasn’t sure either, apart from wanting comfort and the idea that they could be eaten at some point with vegetables), loo roll and tooth paste – not all for dinner. Also, I had been meaning to cook some frozen artichoke hearts that I bought from Turkish Food Centre in Camberwell after reading Claudia Roden’s book of Italian food. 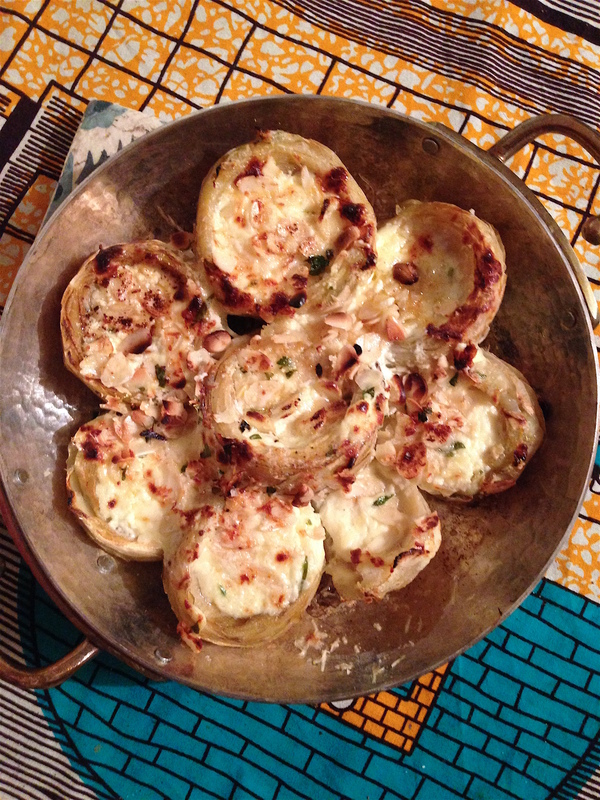 Roden writes that she often uses frozen artichokes. She had a recipe for artichokes in a relatively complicated almond sauce that had been on my mind for a few weeks. I couldn’t be bothered to make her recipe on Sunday, which required quite a few things and processes, but I did make a dish with almonds and artichokes. It was very simple and it went down well with Katia Wengraf, the profoundly personable woman who runs Review Books in Peckham. I stopped by her shop on my way home, and she invited herself over for dinner. I was very glad she did, as it snapped me out of my daze enough to tidy our flat and unpack (two weeks after returning from holiday) and to make this meal. 8 frozen artichoke hearts – defrosted in a bowl of water with some lemon juice squeezed in. Rinsed, brined ones could also work fine for this. First I took the artichoke hearts out of the freezer – there were 8 – and placed them in a bowl of water with a squeeze of lemon juice so that they didn’t go brown. Then I rubbed a piece of butter round an oven dish that would just fit the hearts in, and nested the hearts into it snugly. I placed a blob of butter on each heart with some salt and pepper, and put into the oven for 10 minutes. Then, I took them out, and mixed the parmesan with the crème fraîche and then spooned the mixture over the top of them. I sprinkled the almonds on the top with a few extra blobs of butter. I put back in the oven until the almonds were golden brown and the artichoke was soft when sticking a knife in. I checked the seasoning, added a bit of salt and a squeeze of lemon juice, and served. Place the beans in a large pan covered with water, and bring to the boil, simmer for 15 minutes. Do not add any salt. Throw the water away and then put the beans back in the pan with the gammon, garlic, onion, parsley stalks, fennel seeds, leek and tomato paste. Cover the lot with water again and bring to the boil. Simmer for 10 minutes, while skimming the top of any scum. Put a lid half on, so that some steam can escape and simmer gently, so it’s just bubbling for an hour and a half to two hours turning the meat occasionally. After an hour, add the sherry, vermouth or Shaoxing wine. After an hour and a half – two hours, taste and season with salt until you’re happy with the flavour. Take out the meat, and using a hand blender, blitz the beans so half are puréed, but so there are still beans visible, and stir. Shred or cut up the ham, and return to the pan and heat up. There could be too much ham (we had some leftover). How to make green sauce: In a pestle and mortar, pound 2 garlic cloves with a pinch of salt, 2 tablespoons of chopped tarragon and three tablespoons of chopped parsley and drizzle in 5 tablespoons of olive oil, while mixing thoroughly. If it needs to be looser, keep adding oil. Squeeze in the juice of half a lemon and taste for salt. Spoon some of this over the beans and pork into bowls.